1. To make the filling, combine the brown sugar, cinnamon, and cloves in a medium bow. Stir in the granulated sugar, flour and, and salt. Using a pastry cutter, cut in the butter until combined and the mixture is crumbled. Stir in the nuts. Set aside. If you are making this a day ahead, store in the refrigerator until ready to use. 2. Preheat the oven to 350 degrees. Spray a 10 inch bundt pan (See note) with cooking spray. Set aside. 3. Sift together the flour, baking soda, baking powder and salt into a medium bowl. Set aside. 4. In the bowl of an electric mixer fitted with a paddle attachment, cream the butter and sugar until light and fluffy. Add the eggs, one at a time, beating until well combined. Beat in the vanilla. 5. Add the flour mixture and sour cream in alternate batches, starting and ending with the flour. So add 1/3 of the flour, then 1/2 of the sour cream, 1/3 of the flour, 1/2 sour cream, then the last 1/3 of the flour. Beat each stage until just combined. If you overmix the batter, the cake will be tough! 6. Spoon half of the batter into the bundt pan. Make a well around the center of the batter. Spoon 2/3's of the streusel mixture into the well. Spoon the remaining batter on top of the streusel filling. Smooth it with a butter knife or offset spatula. Sprinkle the remaining streusel mixture on top. 7. The recipe says to bake it for about an 60 minutes, but it took about 50 minutes in my oven. So my advice would be to test it with a cake tester or bamboo skewer at around 50 minutes. The tester will come out clean when it is done. 8. 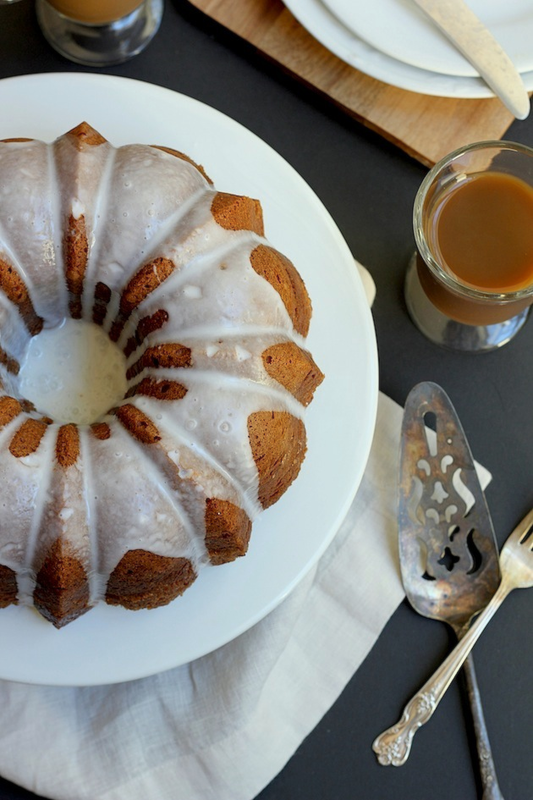 When it is done, transfer the cake to a wire rack and let it cool inside the pan for 45 minutes. After 45 minutes, invert it on to the rack set over a rimmed baking sheet. 9. To make the icing, mix together the confectioners' sugar and the milk until combined. Drizzle it over the inverted cake. Note: I used a 10.5. in x 4.5 in. 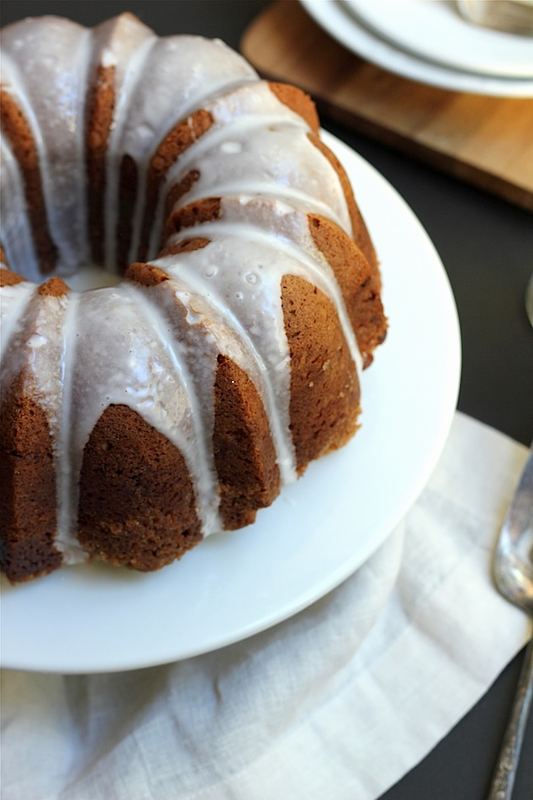 bundt pan like this one to make this cake. If you use the regular-sized pan (10.5 in. x 3.5 in), then you might need less streusel. YUM! I know I've said this to you before, but your photography is amazing! All you photos should be in a magazine! I love streusel anything. 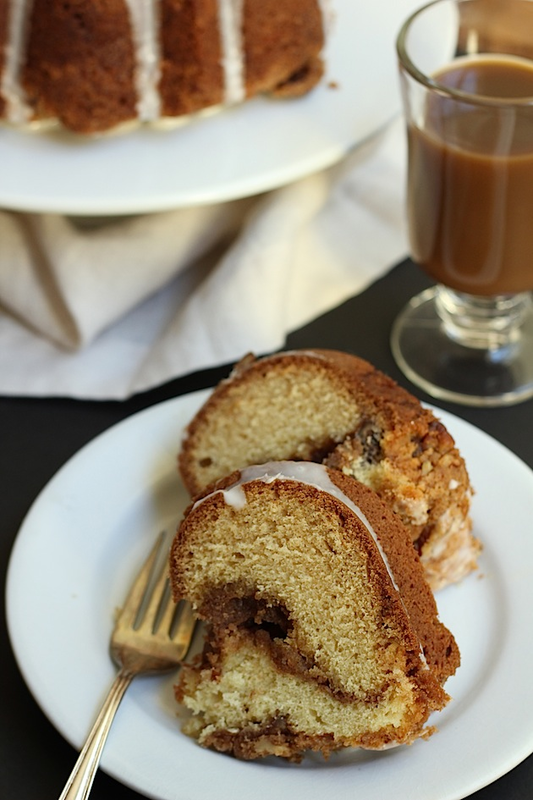 My mom and I make a streusel coffee cake very similar to this and it's hands down my favorite recipe. I want to make it every week. Looks like a perfect Christmas morning dish! Yup, I'll look forward to that in the mail for Christmas Tiffany! Such gorgeous photography! You can certainly tell that you have a passion for both food and photography. It is 5:30 am--I can't sleep--I am pregnant--and I want this so bad. lol. Looks delicious. And I am SO ready for Christmas! haha.